I have a small problem which of course could be easily fixed, but I need to come up with an idea. My current home lacks a formal entryway, and a proper place where we or our guests can hang their coats. Our entryway (which is also our living room) seriously needs a little help so next time our guest come over, I do not have to grab their coats before they inevitably ask, “ umm…where do you want me to put my coat” which would translate to, “ You should fix your coat rack problem! Will you please?”. On the other hand the entryway sets the tone for visitors and is the first and last spot you’ll see as you come and go. Therefore, having a nice and functional entryway is kind of “a must have” for every home. 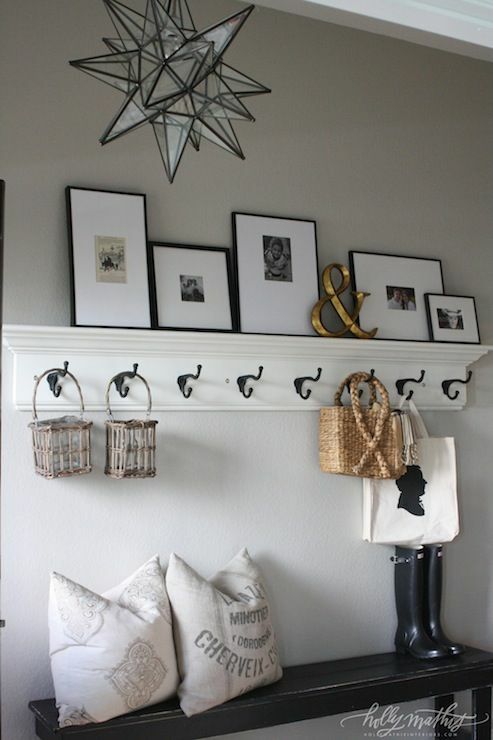 In search for entryway ideas I hit the Pinterest, and I was lost there. There were hundreds of beautiful entryway pictures that I started pinning furiously, reminding myself few minutes later that I am pinning something that is not applicable to my entryway situation. In any case I continued pining for the sake of “feeling nice” seeing all these beautiful design choices and ideas. I hope that you will enjoy viewing these eye candy entryway photos, as much as I enjoyed collecting and commenting on them. Bright and simple entryway with a beautiful rustic wooden repurposed console table, which fills the space with character . 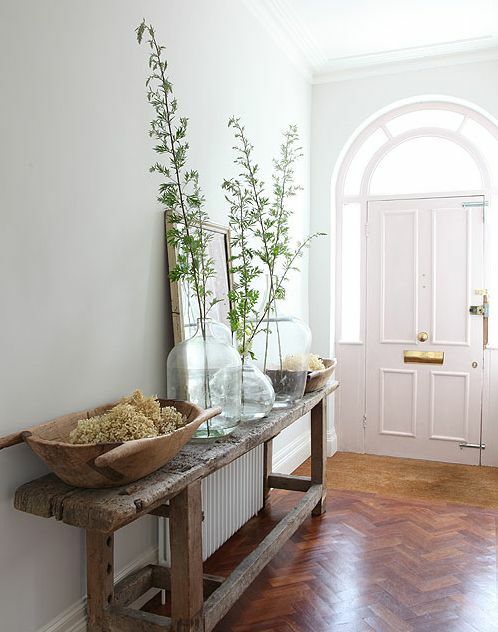 Oversized repurposed glass “vases” and branches make the entryway feel airy spacious, and natural. 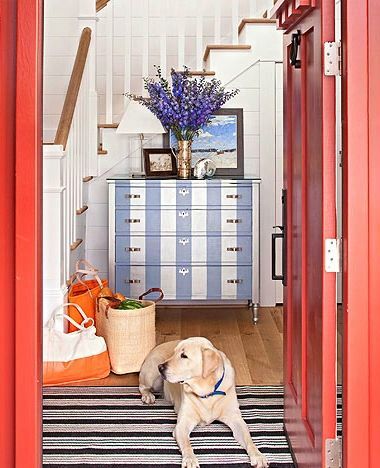 Beautiful mix of colors give this entryway such a welcoming and cheery feel. Dress to impress- is what this entryway suggest. 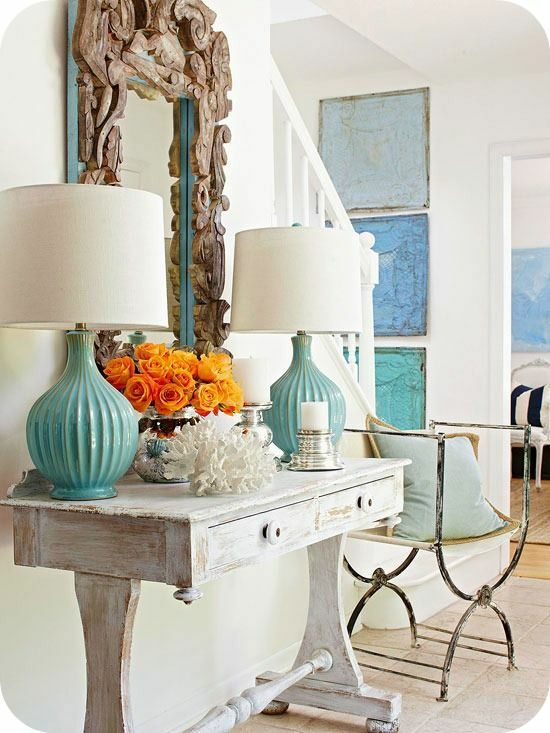 Beautiful white washed console table is all dressed up with turquoise lamps and silver accents. Oversized hand wood carved mirror adds character and the orange roses enhance the glamourous look. 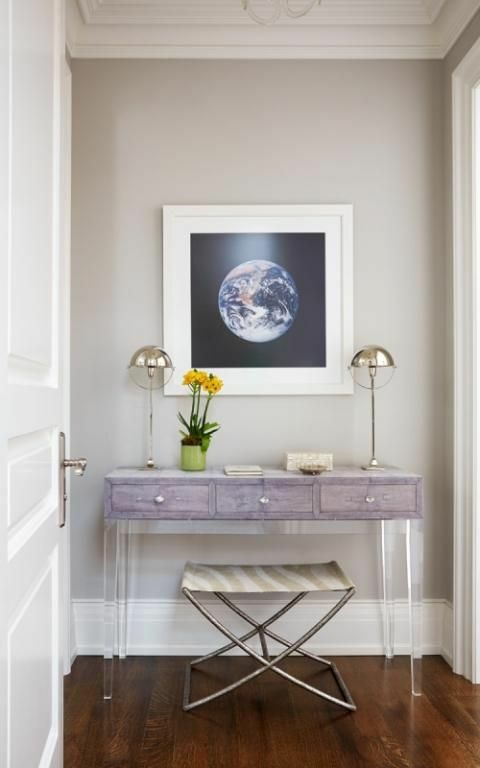 Informal and very inviting entryway featuring an oversized round mirror and a simple console table made from recycled material. I call this Tuxedo entryway. Elegant, white and black striped, lampshades, black console table and gold accents are intended to infuse the formality into this entryway; however, the modern white transparent based bench as well as the fake animal skin carpet makes this entryway feel fun, cheery and inviting. I love how this bare wall in this entryway was turned into a beautiful gallery wall. A simple black shelf was used as a nice display and several drawers below provide for plenty of storage. 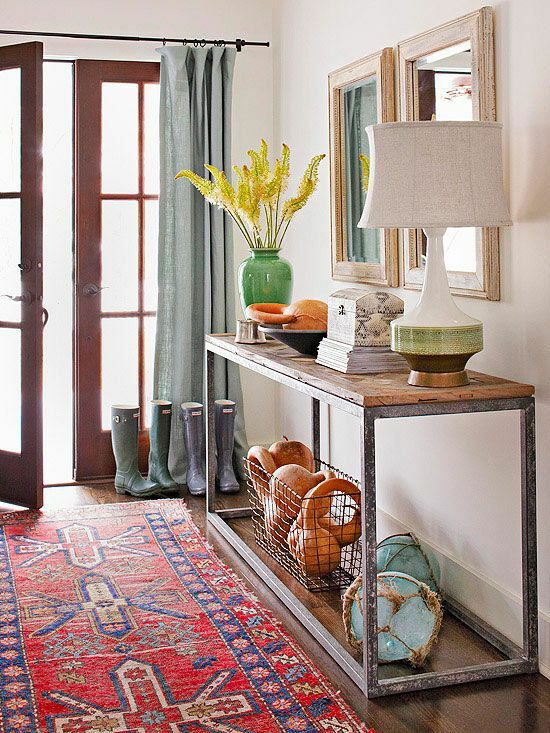 Natural color palette makes this entryway feel cozy, homy and welcoming. 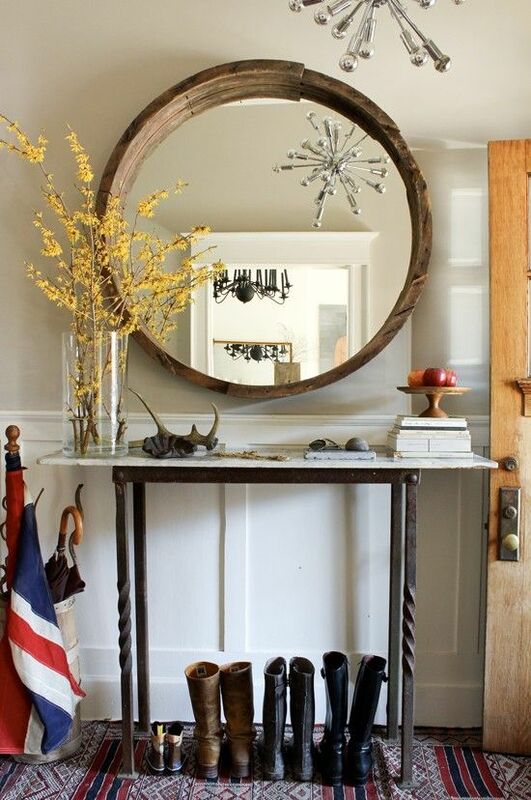 Another simple, yet very homy entryway. A board with hooks serves as a dual purpose: place to hang coats and other stuff, as well as a wall art display. The black bench grounds the space, and it is being used as a shelf and as a place to sit when putting on or taking of boots or shoes. Very elegant entryway suitable for a small space. 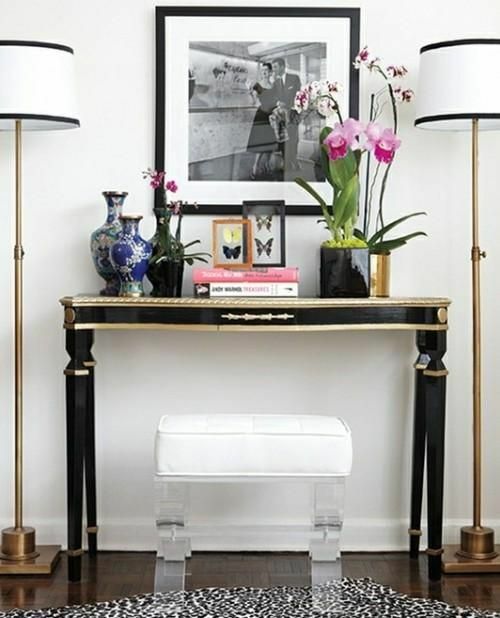 Transparent legs of the console table makes the space feel more spacious. Nickel lamps add such a sophisticated and polished look. I love the color palette; very balanced and yet colorful. The repurposed farm table as well as the oversized jar have added a tons of character to this rather very polished entryway. The contrast of the polished, and the repurposed materials has added an inviting and welcoming feel. Everything has been so perfectly choreographed together so every item in this entryway feels like e piece of art. I love it. Hope that you enjoyed the photos and I wish some of them have inspired you also. Thank you for stoping by, and have a great week. Love the collection of entry photos! I would never think I could get away with branches as large as the ones in the last photo. But they work! And with spring finally making its presence known where I am, I am inspired to bring in some blossoming branches! Thanks! Thanks so much for stopping by and for leaving a comment.